Hard to believe The Sandlot is 25 years old this year, but it is. Because of this fact, those fabulous persons over at Fathom Events are bringing the film back to theaters this summer. Fathom Events will also be treating audiences to an exclusive sneak preview of an all-new Fox Sports documentary about the making of the film. Play Ball! It’s the early 1960’s and fifth-grader Scotty Smalls (Tom Guiry) has just moved into town with his folks (Karen Allen and Denis Leary). Kids call him a dork — he can’t even throw a baseball! But that changes when the leader of the neighborhood gang recruits him to play on the nearby sandlot field. It’s the beginning of a magical summer of baseball, wild adventures, first kisses and fearsome confrontations with the dreaded beast and its owner (James Earl Jones) who live behind the left field fence. Soon nine boys have become best friends, Scotty is part of a team, and their leader has become a local legend in this hilarious and warmhearted comedy. 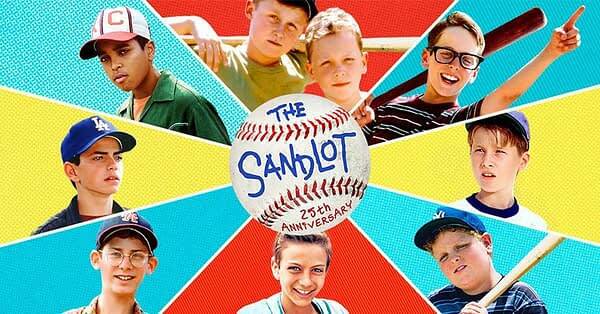 The Sandlot is scheduled for four showings over two days nation-wide — Sunday July 22nd and Wednesday July 24th. You’ll want to check your local theater for showtimes, and tickets are set to go on sale on June 22nd. Also, if you haven’t watched the reunion panel of the original actors, you really should. Get the gang together, grab your favorite mitt, and listen to The Champ’s “Tequila”, just without the tobacco part, okay? Fathom Events is Bringing Transformers: The Movie Back to Theaters - Wanna Win Tickets? Let's Take a Look at The Sandlot Funko Pops! The Sandlot Gets a Wave of Funko Pops, and We Need Them Now!